Shirts Added to TeePublic, Still on Sale! Many of these are brand new to anywhere, so please take a look. Author Staff WriterPosted on November 27, 2015 Categories Design, Physical ObjectTags Advertisement, Alien, Aspen, Blade Runner, Congo, Cyberpunk, Delos Westworld, Firefly, Godzilla, HPL, InGen, Janjira, Japanese, Johnny Mnemonic, Joseph Conrad, Jurassic Park, Korean, Maas-Neotek, MLP, Nostromo, P-40, PKD, Russian, Serenity, SF Cargo, Shirt, TeePublic, The Hunt for Red October, TraviCom, WWIILeave a comment on Shirts Added to TeePublic, Still on Sale! Yes, the circles look squashed, but they are not. That’s just due to the automated mock-up software. I assure you the art is mathematically precise. 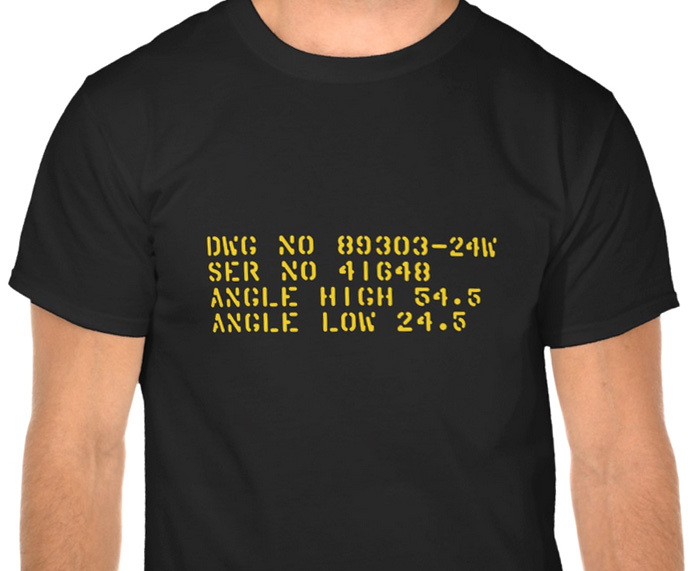 Author Staff WriterPosted on October 13, 2015 Categories Design, Physical ObjectTags Advertisement, Curtiss, P-40, Shirt, USAAF, WWII, ZazzleLeave a comment on For Sale: Curtiss P-40 Warhawk Prop Stencil Shirts! Other bits and pieces will soon follow. I just finished the art for the stencilled data on the propellor blade. That should be approved in a few days. A minor note: the images you see above are composites; mock-ups generated automatically by computer. The art is slightly distorted via this process. I assure you that the circles are mathematically perfect. 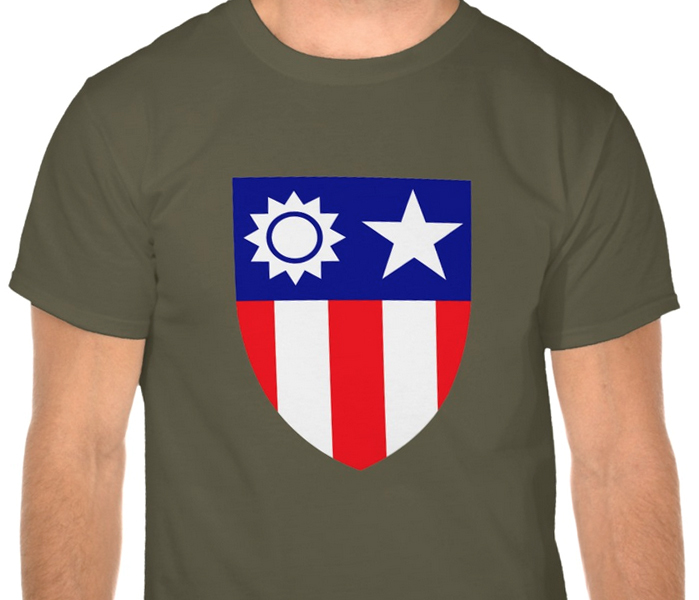 Coming Soon: WWII USAAF Products! I was pleased to see today that my two USAAF designs got approved by Zazzle. Soon a third will join them: I just completed recreating some stenciled text of the propeller of a P-40. And tomorrow I think I will post my original Alien tribute! Author Staff WriterPosted on October 8, 2015 Categories UncategorizedTags WWIILeave a comment on Coming Soon: WWII USAAF Products! Went through some of my grandfather’s personal effects and documents this evening. 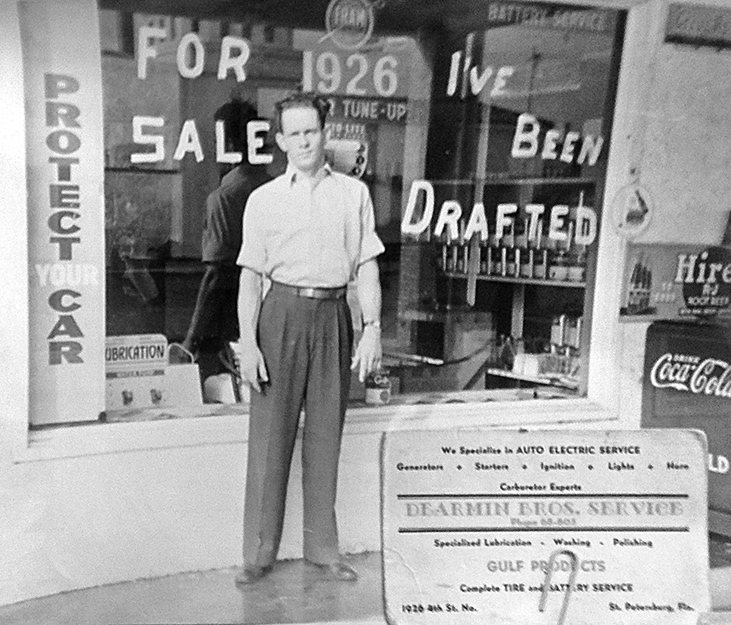 He and his brothers operated a gas station / mechanic’s from around 1932-1942. As you can see from the photo below, when he / they got drafted in 42, they had to sell it. I imagine there were a lot of signs like this at that time. So, he was an auto mechanic from 32-42, then an aircraft mechanic from 42-45 (23rd FG, China), then an auto mechanic with NACA near DC for most of 45, then when he became a civilian, he went right back to being an automobile mechanic. After the war he married and raised two children.